(CNS): A group of activists in Bodden Town, who campaigned hard against the relocation of the George Town landfill to their district, have raised concerns that the Dart Gourp's public relations machine is using a local newspaper to manipulate the public and government into backing the idea, even though the minister responsible has stated his emphatic position that the dump will be tackled on site. In the wake of the major fire at the dump, a.k.a. "Mount Trashmore", the Coalition to Keep BT Dump Free said things would have been even worse had that happened in their district but voiced concern that if government delays in getting started on the dump, the Dart proposal may return to the table. One of the coalition leaders said that unless government acted quickly to resolve the ongoing issue, the proposal to move the dump to Bodden Town could continue to influence the community. However, the activists point out that the Dart solution was emphatically rejected at the polls by the district and the recent fire should not fuel the arguments to move the landfill. 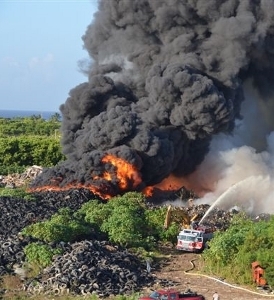 The Coalition said it has long warned of the dangers of fire inherent to a dump and the potential toxic fallout and has continued to call for a solution to the GT dump problem with waste-to-energy, in tandem with a comprehensive recycling programme. “The Coalition has repeatedly insisted that moving the dump — to get it out of Dart’s 'backyard' so that it can proceed with a planned residential project for the wealthy – is not a solution and certainly no protection against further fires,” said Gregg Anderson, one of the founders of the group. The activists stand by their position that establishing a new landfill anywhere on the island, and in particular in BT, would be a disaster for the island’s environment, defying all common sense as well as current world practice. This position was also adopted by the minister with responsibility for the dump, Osbourne Bodden, who said the recent fire at the GT dump would have been much more difficult to contain at the BT site proposed by Dart. Bodden campaigned against the move and has said publicly on many occasions that the landfill will be dealt with where it is. The Coalition accused local newspaper, the Caymanian Compass, of assisting the Dart PR machine and the proposal to move the dump to their district when the paper said government was being “parochial, politically expedient and short-sighted” in opposing Dart’s proposal. The activist said they fear the district could still be threatened, despite the minister’s position, and urged Bodden to act quickly and even consider some of the local proposals that are much less costly than what has been touted in the past. The CIG promised Dart that they were going to remediate the Dump before he started Camana Bay..But it's still just a pile of trash..
Whose Govt was that, McKeeva's?? WOW! Dart is really fool to believe him. Interesting times we live in. Gregg Anderson is an "activist" in Bodden Town, opposing the dump. But as an entrepeneur, he gets shafted by "activists" in East End, who don't want him to put an ostrich farm there. If Dart hadn't built Camana Bay right next to the dump none of us would be having this conversation about moving it to Bodden Town or anywhere else on the island. Instead of Government selling the dump as Foreign Devil suggested, why doesn't Dart just sell a portion of their parcels of land next to the dump to Government for $1.00 and then use that site for the new Waste Management Facility. And guess what, Mr. Dart shouldn't be so sad because he still has the Limestone development to the North of Camana Bay which he could develop along with the other parcels to the north of the Cayman International School. I know its a shame that the master plan is to have residential lots right next to the dump but please just give up onthat dream and don't destroy the dreams of the Bodden Town people who want to remain DUMP FREE. If I were Dart I would leave this to the CIG and let them sort out thier own issues and consider investing elsewere like Little Cayman or out East.. Let the CIG deal with thier own garbage. People seem tot hink this is all about Dart. But the fact is the PPM still haven't came up with a solution in thier own, to fix this stink in GT. If I were Dart, I would leave – full stop. This is the most ungrateful place on Earth. The stink is mostly to do with the WAC-controlled sewage treatment plant instead of the landfill. In any event, how stupid do I have to be to build a multi-million dollar complex next to a landfill and sewage treatment and then ask the country to move it please because it is harming my investment??? Stupid? You mean building a complex within a half mile of downtown, a half mile from SMB, 1-2 miles from SMB resorts, and a half to 3 miles from the highest density of population? You mean a complex that opens up into North Sound? Oh right, lets keep the dump there and move everything else. With a growing 80 foot mound of trash, and scrapping a proposd and partially funded solution, maybe revisit who you are labelling as 'stupid". My friend, I would not build anything next to that dump and hope to get a return on my investment. That dump is not going anywhere for the next 50 years, trust me! and I'll be dead by then. The delays is becuase they have no solution, becuase they have no money. These guys are saying government has to do something now, but where do they expect them to get the money from.. The dumps (including the one in Little Cayman) and the prison need to be located in Cayman Brac. Yeah Yeah Yeah and these BT Only Activists are using other news services to fuel their PR Engine. How is that any different..Thier message is basically keep BT Clean, to heck with the rest of us..
Boddens legacy with be the man that let a whole country down to please his own district..It's clear thehe has on BT's best interests at heart.. The delays are clearly becuase he has no answers, if there are then lets hear them. What the Compass has been saying is right, it doesn't need to say it in support the DART PR machine. It is not right for the [people] in Bodden Town to keep characterizing the proposed Midland Acres waste management solution as a dump, but they keep doing it to push the emotional buttons of the less well informed in the district. It was a mistake for the PPM to allow its new Minister to say what he said as soon as he said it after the election, thus setting a parochial agenda for the party that was elected to work for the well being of the whole island. It's blatantly misleading to say that a fire, like the one that recently occurred, would be much worse in Bodden Town, when such a situation could not occur in the planned alternative scheme. The majority of well informed voters, even those in the Bodden Town district, know that the current situation must change and that relocation and a new overall strategy towards waste management is the right answer. Thank you to the BT Coalition to keep BT dump free and to Mr. Bodden for standing up to the Compass and the Dart Billionaire Group! We may not have all the millions in BT but we have been here long before Dart knew of the Cayman Islands! Little by little our way of life is being threaten, we have already given away our Westbay Rd and they continue to push for our peaceful BT to be another commercial district! Great article CNS and once again we have to continue this fight! The public must remember that Dart was only paying for Phase one which was maybe 15% of the whole project! So it will not be by any means FREE as the Compass claimed on the Friday's editorial. Shame on you Compass for misleading the public! Nothing is free in This world! Since it seems that the problem of what do with the myriads of old tyres is a major problem; I wonder if there has been any attempt to reach a solution by using a brain-storming process. Such a process in which a number of people can freely put forward possibe solutions, without limitng the suggestions to what would be practical, or fit within existing restrictons etc. it can lead to an idea that will be workable. For example:: . What about using the tyres to make one or more artificial reefs that could enhance fish popualtion? What about the possiblity of using the old tyres as part of the fill in making a break-water that could povide shelter for a boat dock or launching ramp? What about the possiblity of using the old tyres as part of the fill for maing a fishing dock? Would shipping the tyres away or burning them be a better solution? If so, is there a practcal way of doing either one? Would it be possible to put the tyres on a barge and burn them where the smoke woulld go out to sea? It is obvious that a solutiojn has to be found, and while a pefect solution may not be found, a workable solution should be reached even if some hard-headed or selfish pople have to be pressured to reach a comprmise. The simplest soultion work be to buy a tire shredder and sell the shredded rubber for fill which Cayman has shortage of. It's a No Brainer.. I dont work for Dart nor have any affiliation with Dart, and Im certainly not wealthy, but I agree with the Compass article. Driving home from work today on the bypass with my windows down I could smell the sour stench coming frorm the dump. Im no scientist….but that aint right! Day after day things are getting worse and worse, and piling on layer after layer. And there is no urgency. None At least Dart proposed 21st century plan and would assist in funding. Very easy to run around with pitchforks and condemn 'evil Dart'. Hopefully the dump enthusiasts hold their next rally at Mt Trashmore. It is remarkable the way in which the Caymanian Compass has suddenly become so Americanized, with regular and prominent political commentary from Washington DC, the blatant use of American English spellings like "tires" (here in Cayman the official language is British English), and of course the mouthpiece for Dart. One would almost suspect it was owned by this company or it had a major stake in it. From the dartorials, I though a local paper was their PR machine. Despite being an attractive technological option for waste management, combustion-based processes for landfill solid waste treatment are a subject of intense debate around the world. In the absence of effective controls, harmful pollutants may be emitted into the air, land and water which may influence human health and environment. Although incineration of municipal waste coupled with energy recovery can form an essential part of an integrated waste management system, yet strict controls are required to prevent its negative impacts on human health and environment. Sell Dart the stinking dump for a dollar, let him prepare the site in Bodden town for the new WMF, then it will be up to us to run the new facility in an intelligent manner. Why a dollar? Why not a fair price relative to its value to Him? I think that's the problem, Up to US!!!!. Noone want to do anything they all wan't it done for them for free no actually they want to someone to pay them to do it.. I bet everyone would recycle if they got paid to do it.Everyone would be happy with the Dart deal if it put money in thier own pockets. "Us run the dump", you mean CIG? This will end up being a be a new dump not a fresh start. Keeping the mess where it is for now is far better than contaminating more land. Uhm, except that Dart doesn't want the Dump and the responsibility that goes with it. (After its sold, if it explodes in thermo-nuclear meltdown beause 20 years ago someone smuggled in radioactive waste – just to be silly, then its the owner's problem.) Dart wil gladly pay to move its operations and to put some rose bushes on top but it will still be CIG's responsibility. No getting around that. And that as it should be they are the ones that allowed this to happen for 2 decades, I can't blame dart for not wanting to be liable for health related lawsuits do to the contents of the dump. He is willing to build the first stage of the new facilty and pay to cap the current one which will require decades of maintenance but noone in thier right mind would be willing to accept liability for what was put in there over the last 20 years.. I strongly believe that Dart would actually prefer for the CIG to do someithing about it on thier own with him having to pay for it even if it's in that same location. A fresh start??? Roydell Carter still cant get the collection right so what do you think will happen if CIG move it? How does one lift the dangerously combustible mountain of trash to properly line underneath without moving the pile? Leaving it there is an ongoing environmental and ecologicaldisaster and our response will be the greatest initial test of the NCL. I've been thinking the same thing for some time now. That seepage should be our main concern. A properly lined landfill does not seap into the ground, this is the problem with Mt Trashmore it wasn't lined so everytime it rains the rain water seaps through and is contaminated.. Funny , the NCL has nothing to do with the dump. What a shame they put so much into getting the NCL passed but ingored the greatest threat on the island..